Where to Stay: Latin Quarter (5th) or St. Germain des Prés (6th) for cafés and clubs that stay open all night, and where the streets are packed at 2:00am. Must Pack: Your personal hangover cure. 1. 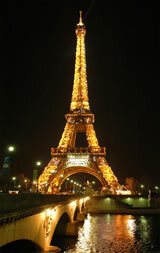 Eiffel Tower - The TOP nightime experience in Paris. 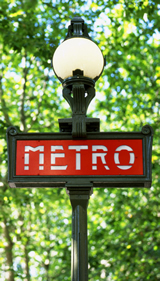 Forget what the tour books advise and take the métro to the Trocedero station instead of the closer Bir-Hakeim. Walk past the Palais de Chaillot and stare as you descend through the Jardins du Trocadéro to the Eiffel Tower framed by the Trocodero's colorful fountains. Cross the charming Pont d'Iena over the Seine, and marvel at how HUGE the Eiffel Tower is when you standing under it. If you're not tired and want to save a few euros, climb the stairs to the second level of the Eiffel Tower. Finish off your tour with cocktails in the Eiffel Tower's chic Altitude 95. 2. Bateaux Mouches (fly boats) - View Paris from a boat in the middle of the Seine. Very interesting to see where you walked during the day from this perspective. Take the boat tours at night - you'll understand why Paris is called "The City of Lights". You can listen to historical commentary about the city on headphones, or simply bask in the view. We avoided these boats for years, considering them "tourist traps", but wished we would have taken the 1-hour ride years earlier. One of the most convenient debarkation points is by the Eiffel Tower. 3. 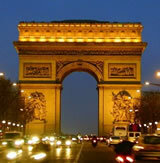 Have a Meal of a Lifetime - In Paris, dinner is not only a meal, it is an art form. Bask in the candle-lit ambiance, drink great wine, and let yourself be overwhelmed by the attention to detail - from the table linens to the presentation on the plate, from the personal attention of the chef (many chefs come to your table to ask about your meal) to the flavors of the cuisine. You don't need to spend a fortune for this experience. The philosophy that "food nurtures more than the body, it feeds the soul" is noticeable in the smallest, most reasonably-priced restaurants. See our restaurant lists for some recommendations. 4. Visit a Café - In Paris, there is a café for your every mood, and all budgets. By day, there is nothing more Parisian than leisurely sipping a drink, enjoying your companions conversation, and people watching in a café in Paris. By night, many cafés turn into fun, bar atmospheres with a distinctly Parisian twist. Below are a few recommended cafés that are best visited at night. 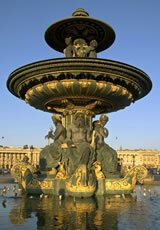 Click here for a detailed list of cafés by arrondissements. St. Germain des Prés - Try The Mondrian - Like an opium den on speed. Sip one of their signature cocktails while watching the ultra-hip bartenders mix drinks by tossing bottles ala Tom Cruise in Cocktail while dancing to the Grease soundtrack on the bar. A 24-hour café/club. 148 blvd St-Germain, 6e. Café Mabillon - Trendy meet market next to The Mondrian. A 24-hour café/club.164 blvd St-Germain, 6e. La Grimace - Small bar in the 6th. 80's music and specialty drinks in baby bottles. 60 rue Mazarine, 6e. Le Sanz Sans - Latin, funk, and house mixed with affordable drinks (for Paris). Not too shabby.49 rue de Fubourg St. Antoine, 3e. Beige - Minimalist café in the Marais.13 rue des Archives, 3e. La Belle Hortense - Bookstore/bar/art gallery/wine shop 31 rue Veille du Temple, 4e. Footsie – If you are looking for a night out without having to break the bank, Footsie - just down the street from Harry’s American Bar - is the place to go. The name is a play on the London Stock Exchange (the FTSE) Every 4 minutes, drink prices will change – going up or down – based on the “market” consumption of the patrons. We’ve watched beer drop down to less than water - and don’t forget this includes all drinks even the top shelf liquors. 10-12 rue Daunou, 2e. 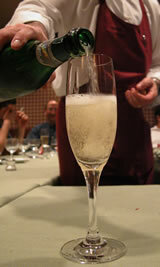 For more choices, view of list of Best Paris Bars. 5. Walk along the Seine - The subtle play of light on the waters of the Seine at night has to be seen to be believed. 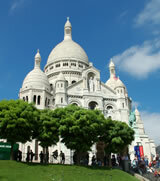 Take a stroll, and bask in the sublime beauty of Paris. 6. Visit the Centre Pompidou - The Centre Pompidou houses Europe's greatest collection of 20th century art. It is also "working museum" hosting a huge library and working rooms for Parisian students. At night, the area between the Pompidou and Les Halles is teaming with young people enjoying a Parisian evening, street performers, and portrait artists. The energy in this area at night is contagious. Visit the museum (open every day except Tuesday until 10:00pm), then café hop on the pedestrian walk between the museum and Les Halles passing the fountains at Church St. Eustache with the famous huge buried head sculpture. Many tour books warn you away from this area. The only danger we can imagine is if you are allergic to being surrounded by ethnically-diverse twenty-somethings hanging out. Go there at night for a local Parisian experience at non-tourist prices.